Similar to water, a state of light does not possess a definite shape, but rather assumes that of the container that it occupies. In particular, any quantum state of light is a specific way of “filling” an empty container, the mode, which describes the spatiotemporal shape of the electromagnetic field. Any quantum state, like a single photon (the filling of the container with just a single quantum of excitation), can thus come in many different shapes, according to the shape of the mode it occupies. January 09, 2009: "Adding and Subtracting Photons for Fundamental Tests of Physics and for Optical Quantum Technologies"
Most applications of the quantum properties of light to novel technologies critically depend on the precise knowledge of the mode shape. If not perfectly under control, the processing, detection, and use of quantum light states become very inefficient or plainly impossible. For example, future quantum networks require that light interacts with atomic species to perform quantum processing and implement memory units. These tasks require a very specific and precise preparation of the photonic wavepacket, i.e. of its spatiotemporal mode, such that it optimally couples to the different possible interfaces. On the other hand, in a typical experiment for the complete tomographic reconstruction of some quantum light state, homodyne detection only works with sufficient efficiency if the mode of the reference classical coherent field (the so-called local oscillator, LO) is perfectly matched to that of the state under examination [1,2]. If little or no prior information on such a mode is at hand, or if the mode itself has been somehow distorted during the propagation from the source to the detector, one may completely miss the target in the detection stage. Figure 1: Artist’s view of the optimal detection of a shaped single-photon by mixing with an equally-shaped intense coherent light pulse on a beam splitter. This is the principle of the homodyne detection technique that was used in the experiment. Based on this characteristic of homodyne detection, our research team at the Istituto Nazionale di Ottica (INO-CNR), Florence, Italy, has developed a new scheme, putting together concepts and techniques from the fields of ultrafast and quantum optics, for the complete measurement and the possible exploitation of the spectrotemporal shape of ultrashort nonclassical light states . Using the measured efficiency of homodyne detection as a feedback, we applied an adaptive procedure based on a genetic algorithm to drive a random initial population of LO shapes towards the faithful representation of the fragile temporal mode of a single photon. We tested the procedure with single photons of the duration of a few tens of femtoseconds that were generated under different conditions so that their spectrotemporal mode presented a variety of modulations [4,5]. In all cases we were able to completely map the photon wavepacket mode -- that is its spectral and temporal intensity/phase profile -- onto that of an intense coherent light pulse, which was then characterized in detail by means of standard techniques, like interferometric autocorrelation and FROG (Frequency Resolved Optical Gating). 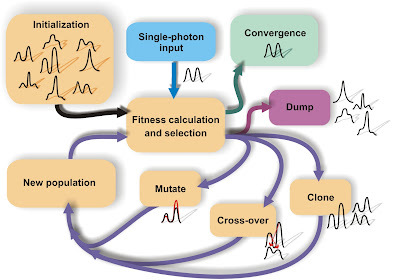 Figure 2: Scheme of the genetic algorithm used to match the LO spectrotemporal shape to that of the generated single photons. Starting from a set of random LO shapes, the efficiency of homodyne detection is gradually increased by means of a genetic-like evolution of the initial shape population. Interestingly, the scheme is not limited to the measurement of the spectral and temporal shape, and it is certainly not confined to using single photons. If a modulation of the LO wavefront is also introduced, the full spatiotemporal mode of the state can be completely probed in a similar way. Furthermore, the mode of other quantum light states besides single photons can be analyzed by properly choosing the right merit function in the adaptive algorithm. 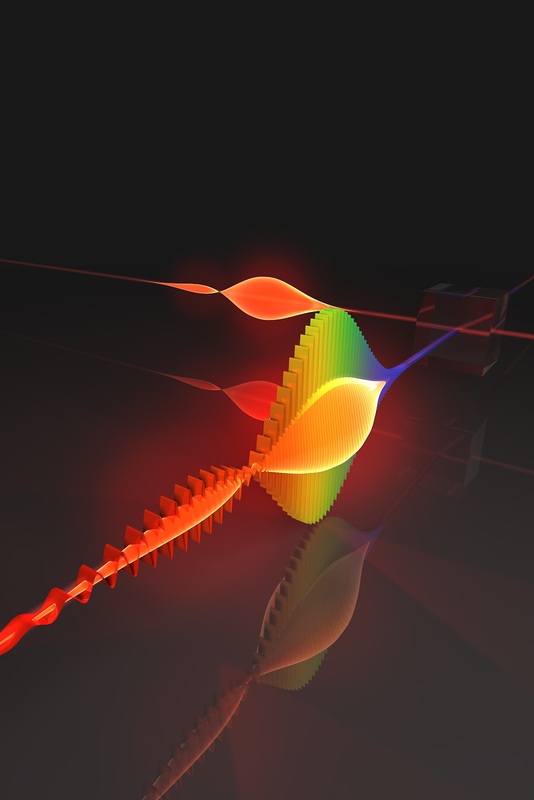 The ability to precisely access the complex spectrotemporal structure of single photons can also be used for clever encoding and decoding of quantum information. This is possible by exploiting the different ways a single “filling” can be coherently distributed among a collection of different “containers”. More precisely, one can use different orthogonal spectrotemporal modes as different “letters” in a quantum alphabet, and encode information in the way a single photon is coherently spread over several of them. We clearly demonstrated this possibility by measuring the internal coherence of a single photon distributed between two distinct spectral modes, but our approach has the potential of dealing with much more complex situations. Figure 3: Measured spectral intensity and phase profiles for a single photon coherently delocalized between two distinct spectral modes. The possibility of using a larger quantum alphabet would bring enormous advantages to the field of quantum communications when compared to standard schemes normally based on qubits, i.e. on an alphabet consisting of only two possible states (like those based on light polarization or time-bins). “Time domain analysis of quantum states of light: noise characterization and homodyne tomography”, Alessandro Zavatta, Marco Bellini, Pier Luigi Ramazza, Francesco Marin, and Fortunato Tito Arecchi, Journal of the Optical Society of America B, 19, 1189 (2002). Abstract. “Continuous-variable optical quantum-state tomography”, A. I. Lvovsky and M. G. Raymer, Review of Modern Physics, 81, 299 (2009). Abstract. “Adaptive Detection of Arbitrarily Shaped Ultrashort Quantum Light States”, C. Polycarpou, K.N. 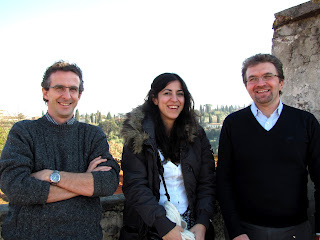 Cassemiro, G. Venturi, A. Zavatta, and M. Bellini, Physical Review Letters, 109, 053602 (2012). Abstract. “Nonlocal pulse shaping with entangled photon pairs”, M. Bellini, F. Marin, S. Viciani, A. Zavatta and F. T. Arecchi, Physical Review Letters, 90, 043602 (2003). Abstract. “Nonlocal modulations on the temporal and spectral profiles of an entangled photon pair”, Silvia Viciani, Alessandro Zavatta and Marco Bellini, Physical Review A, 69, 053801 (2004). Abstract.